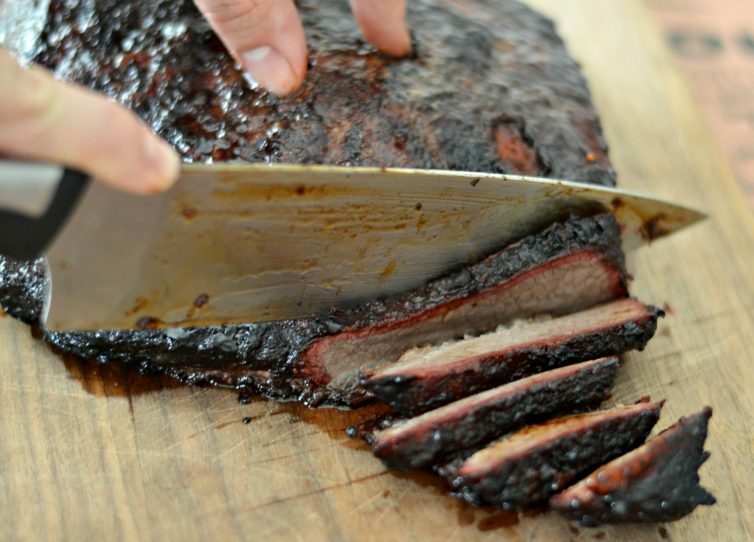 Inside: This Smoked Brisket Recipe will have everyone licking their fingers and asking for more. The secret is in the delicious, homemade mop sauce and the slow cook on the Traeger wood pellet grill. The first time I tried smoked brisket was at a delicious BBQ restaurant in San Antonio. We were visiting some friends, and they told us that we absolutely had to go. We tried a few things, like ribs, sausage, and of course – brisket. I had never tried brisket before because it is not a common cut of meat that people eat in Mexico. After that first try though, I fell in love. It was so tender and juicy, and the crust on the outside was to die for. Served with some delicious barbecue sauce, there isn’t much more you could ask for. We have had smoked brisket a few more times over the years, but we had never tried to make it at home. One reason is that we never had a smoker! That problem was solved a couple of months ago when I bought my husband a Traeger Texas Elite Pellet Grill. He had been asking for a smoker for a while, and I decided that this was the time to surprise him. The Texas Elite Pellet Grill is one of many that Traeger offers. We decided to go for this particular grill over smaller grills with added features because of the size. It has 646 square inches of grill space – so plenty of room for smoking anything and everything! Just so you can envision it, that is enough room for 8 full chickens, 8 racks of ribs, or 30 burgers! We have used it to make burgers, chicken, ribs, smoked salmon, and even pizza! You can even use it to make beef jerky following this recipe at SlowPokeCooking.com. Which Smoker Should You Get? Texas Elite Pellet Grill 34. This is the one that we have, and it is amazing. It has tons of capacity for the wood pellets and lots of room for grilling. The controller is digital, so it is super easy to use. There are a couple of features I would like to have (like wifi control, and the built-in meat thermometer), but overall it has been amazing! Timberline 850 Pellet Grill. I have my eyes on this one for our next pellet grill. It has the Traeger WiFire feature, so you can control it with your phone. It also has the built-in meat thermometer, so both features that we are looking for! It isn’t as wide, but it still has plenty of room with the removable racks. You can get this in a larger size by upgrading to the Timberline 1300 Pellet Grill. Junior Elite Pellet Grill. If you are looking for a less expensive option, you might consider the Traeger Junior Elite Pellet Grill. It has about half the space as the Texas Elite, but it is also about half the cost! 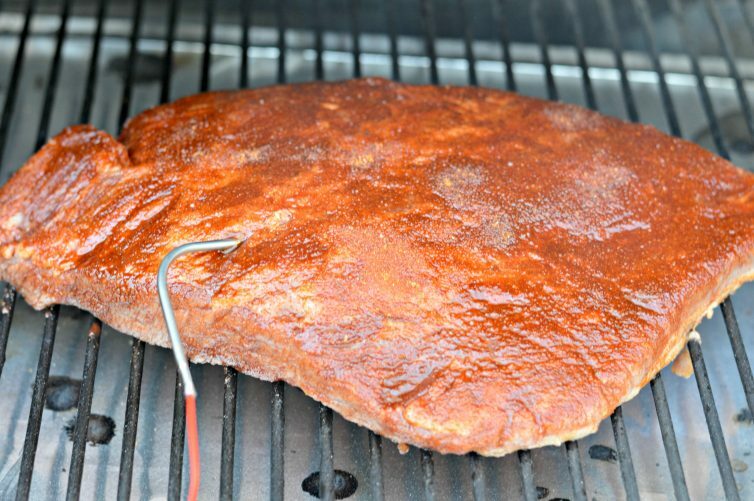 It is a great introductory smoker and will still allow you to make this delicious smoked brisket recipe and more! If you have never used a pellet grill, you might be wondering how they work. Well, it is pretty simple. The pellet grills have a hopper where you add the wood pellets. You set the temperature, and the wood pellets are automatically fed into the heating pot where they burn and create the amazing smoke that is used to cook and infuse flavor into your food. There are many different flavors that you can buy, so I recommend you experiment with a few. Here are some of my favorites. Traeger Signature Blend. Hickory, Maple, and Cherry Woods. This one is delicious and works well for a variety of different meats. Mesquite. This is one of our favorite stand-alone flavors. It is good whether you are making poultry, fish, or beef. Apple. We really like to use this one for pork, chicken, and veggies. It gives it a tasty flavor that everyone will love. This past weekend, my husband decided he wanted to try his hand at smoking a brisket. We had a 4.5-pound brisket that we had bought and froze a week or two ago, so this was a perfect opportunity. Since this was the first time we had decided to make smoked brisket, he did some research. 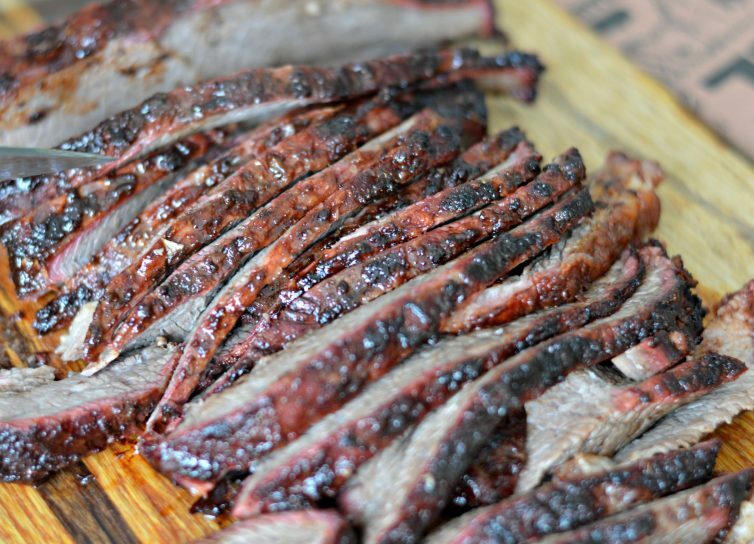 While we are not experts, we found out that the following points are important if you want a delicious smoked brisket. Time. Plan on smoking the brisket for 1-1.5 hours per pound. Our 4.5-pound brisket was on the smoker for just over six hours. 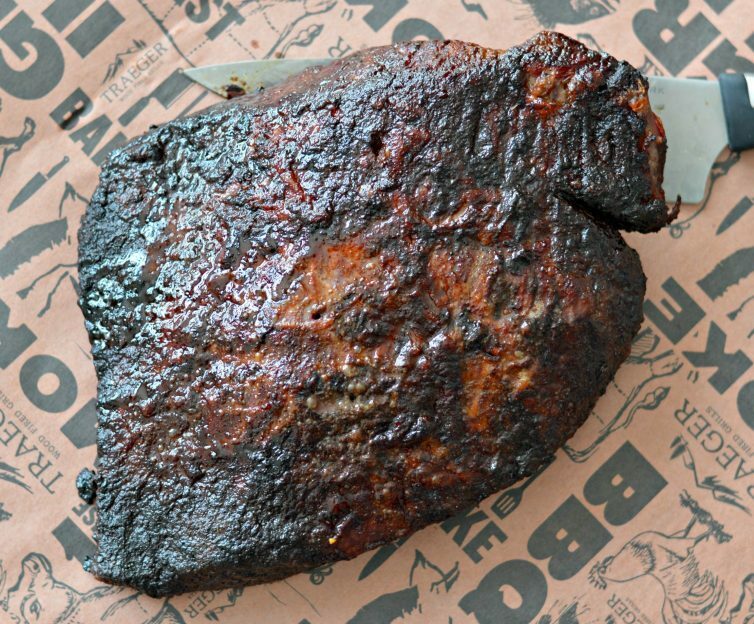 If you have a larger brisket, you will want to make sure you start it early in the day and plan to eat it later. Defrost the Brisket the day before. You will likely spend a good part of your day smoking the brisket, so you don’t want to start with a frozen brisket the day you want to smoke it. We started defrosting our brisket about 16 hours before we planned on starting the smoking process. It was perfectly defrosted and ready to go the next day. Use a good rub. Brisket is so amazing that you can season it with just about anything and it will turn out great. Some people use just salt and pepper, but we decided to use the Traeger Beef Rub. You will want to apply it generously to each side of the brisket. Trim the fat. If your brisket isn’t pre-trimmed, you will want to trim off a layer of fat. You want to keep the layer of fat on there, but you should trim it down to about 1/4 of an inch or so. Smoke the brisket fat side down. This may be controversial, but this is how we did it and it turned out perfectly juicy and tender. Let it rest. 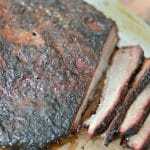 You will want to let the brisket rest for at least 20-30 minutes before slicing it. This will allow it to reach the final temperature (see #7 below) and is absolutely necessary for a tasty smoked brisket. Take it off the smoker when the internal temperature reads about 185-190 degrees Fahrenheit. It will continue to cook as you rest it, and you want the final temperature to be between 195 and 200 degrees. This will result in a tender, juicy, and delicious brisket. Use a mop sauce. 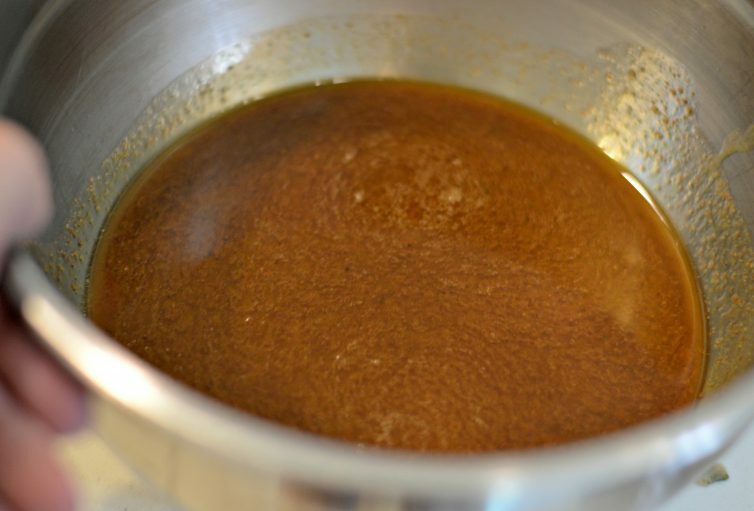 A mop sauce is a thin sauce that you will spray or brush on the brisket just about every hour during the smoking process. This helps keep it juicy and prevents it from drying out. In the recipe below, I am including the mop sauce that my husband came up with for ours, and it is amazing! The Smoking Process on a Traeger. I went over some of this above, but here is the actual process for when you are ready to smoke the brisket. Remember, this is for a 4.5-pound brisket. Times will vary based on the size of brisket you are using. 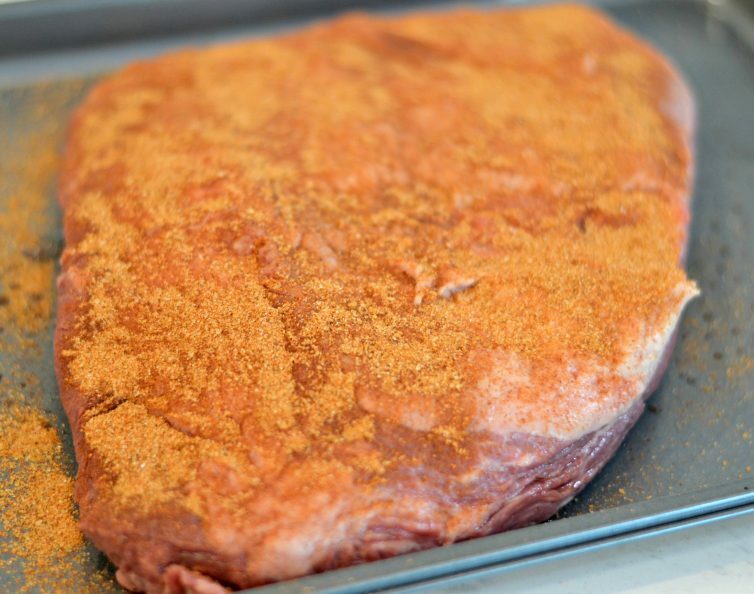 Whatever rub you are using, make sure that you cover both sides of the brisket. Add brisket, fat side down, to the smoker and cook for 2 hours on the “smoke” setting (this ranges from 150-180 degrees Fahrenheit). 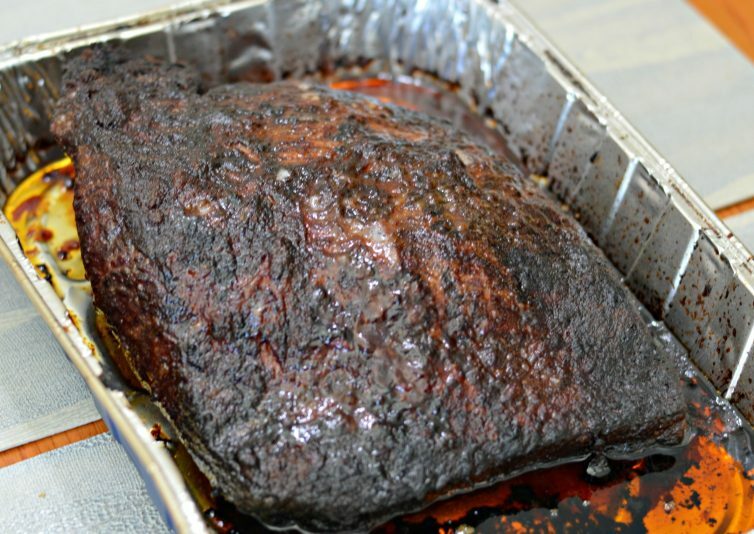 After the first two hours, place the brisket, fat side down, into an aluminum foil baking dish, and return to the grill for an additional 4-5 hours at 225-250 degrees Fahrenheit (or when it reaches the correct internal temperature). Take the mop sauce that you will make it advance, and spray it on the brisket every hour during the process. You can add it to a spray bottle, or you can just lightly brush it on. Remove the brisket when it has reached an internal temperature of 185-190 degrees. Let brisket rest for 20-30 minutes. Cut into pencil-thin slices, against the grain. We usually like to invite people over when we use our smoker, but we weren’t sure how the smoked brisket would turn out. As a result, we decided to test it on ourselves. Let me tell you – it was one of the most delicious meals we have had in a while. The brisket was super juicy and tender and it had the most amazing flavor. We served it with mashed potatoes, but you can really serve it with just about anything. The smoked brisket is so good, you don’t necessarily need a sauce, but we served it with Traeger’s Sweet & Heat BBQ sauce. It added a little something that we just loved! Here are some ideas for some other side dishes. If you have leftovers, smoked brisket is great on sandwiches, on nachos, with fries, or as tacos. We finished our’s off the next day in sandwiches, but the sky is the limit here. Like I said above, we aren’t experts, so please let us know in the comments below how this turns out and if you have any other tips for smoking a perfect smoked brisket. 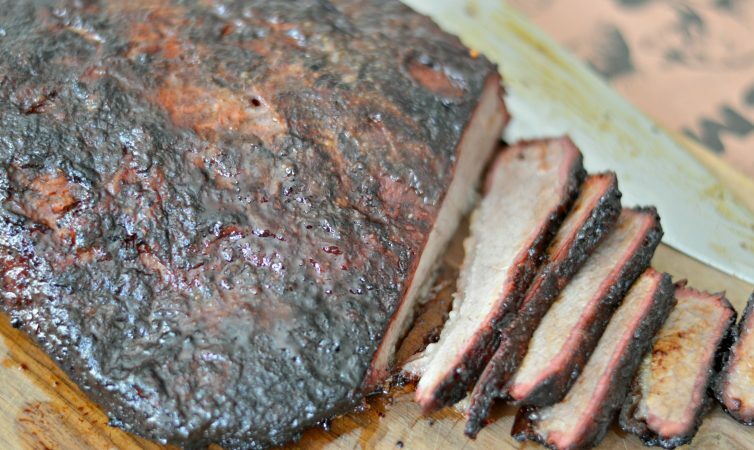 This smoked brisket recipe is a perfect option for beginners. Don't forget the mop sauce! Spray with the mop sauce every hour. Continue to smoke for 4-5 hours. Remove from the grill when the internal temperature, in the thickest part of the brisket reaches 185-190 degrees. Let rest, lightly covered with aluminum foil or butcher paper, for 20-30 minutes at a minimum. Cut against the grain in pencil-thin slices. Combine all of the ingredients and whisk together until no big lumps remain. Add to a pot and bring to a boil. Lower heat to low and let simmer for 10 minutes. 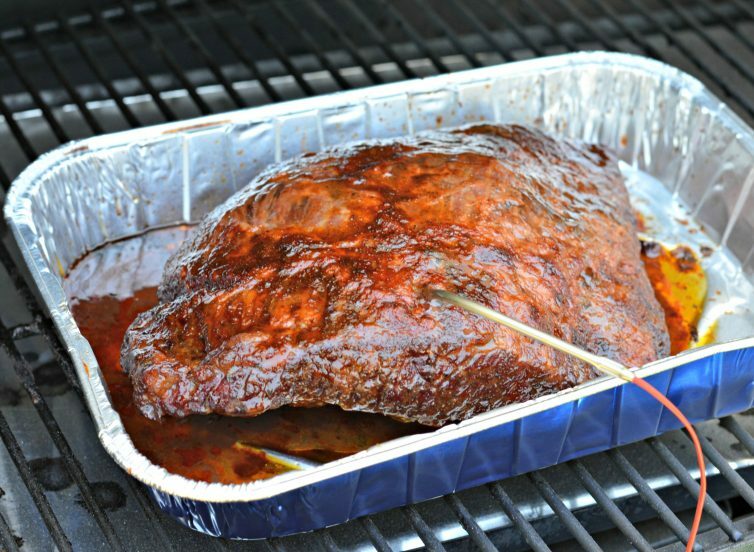 Add to another bowl or a spray bottle to spray or brush onto the brisket while cooking. *increase cook time by about 1-1.5 hours per pound of brisket.